The estimated time to read this page is only about a minute – we guarantee it will be worth your time in your pursuit of getting that coveted fire department badge! You want every tool available at your disposal to shorten that learning curve between you and that badge. 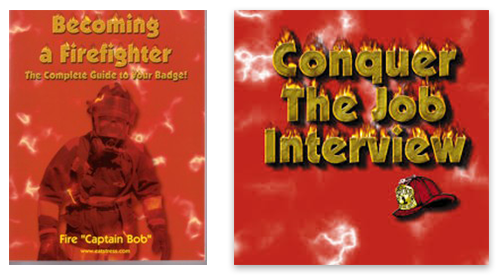 Capt Bob's book, Becoming a Firefighter: The Complete Guide to Your Badge, is dedicated to those who possess the burning desire to acquire a firefighter badge and become one of America's last heroes. This book has helped over 4,200 candidates nail their badges. Step by step, this book has everything you will need to know about the hiring process, starting with the application, written, physical, oral, psychological interview, background, polygraph and medical exams to help you gain that coveted badge. In this book, you will find the inside nugget tips and resources that you can't get anywhere else. The firefighter entry-level job interview is one of the most misunderstood and least prepared for portion of the testing process. I've seen candidates with great credentials, but can't present the package at the interview. And, if you can't present the package, you don't get the job…period! Never! Ever! Are you a firefighter candidate that wants to shorten the learning curve between you and that badge? Do you want to find out what skills you may be missing? Do you feel like you have hit a wall in your orals and don’t know what to do next? Have you already figured out that you just can’t wing the oral board? If you answered “yes” to any of these questions, then you need to get Capt. Bob’s entry-level Oral Interview Program that has helped thousands of individuals to get the job of their dreams. Capt Bob will teach you how to get bonus points by personalizing your answer. The "Nugget Principle" enables firefighter interview applicants to personalize their presentations to separate them from the "clone" candidates. No one else can tell your story. Once you start lacing answers with your personal life experiences, no matter if they aren't fire department related, is where you start creating the magic. If you don't know how to establish yourself and the other essential skills needed to score high enough, you might as well not show up. You're dead meat! The goal is to convince the firefighter oral board that you can do the job before you get it. Stories demonstrate your experience. They tell the board that you not only know the answer to an oral board question, you have already lived it.